Lucasfilm and Disney Interactive today launched the official Star Wars app, a new free app that puts fans into the Star Wars universe right from their mobile devices. Available for iOS and Android, the app provides breaking news, rich media, social updates, special events, and interactive features for the countdown to Star Wars: The Force Awakens and beyond. News: Get instant notifications on big announcements from across the franchise, including trailer releases, movie updates and game news. 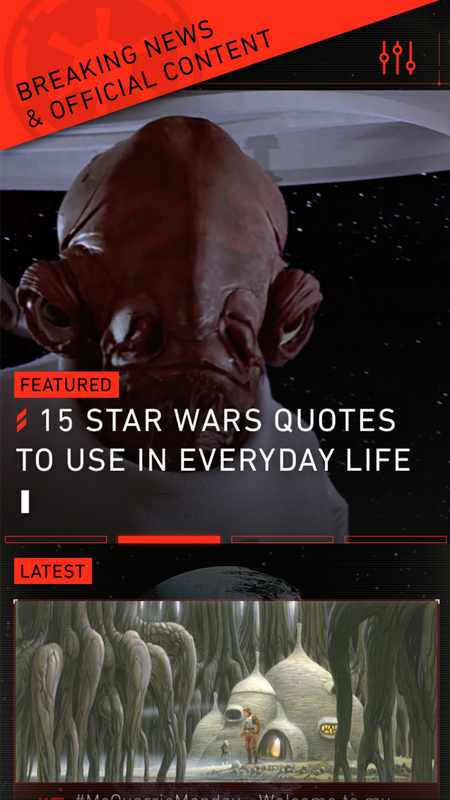 The news feed is fully customizable, so users can filter which platforms their updates are coming from, and which aspects of the Star Wars franchise they're hearing about. 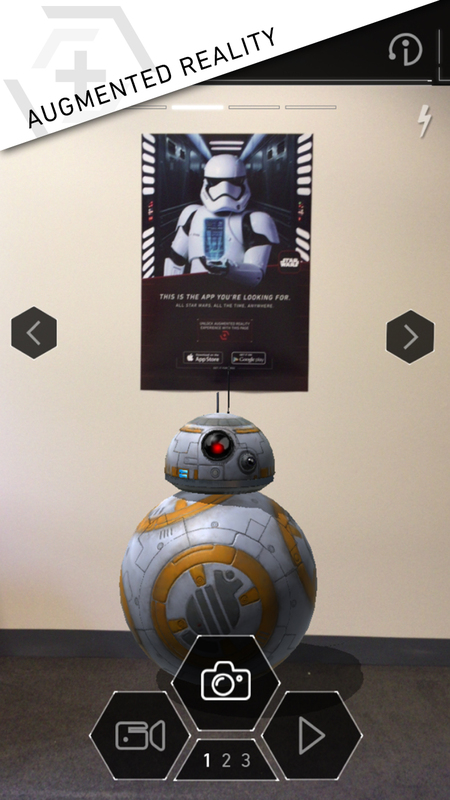 Augmented Reality: Bring the Star Wars universe to life by unlocking 3D characters from Star Wars: The Force Awakens using an exclusive augmented reality camera feature. The trigger for this feature will change over time, introducing new characters and objects. Videos: Watch official Star Wars videos, including movie trailers, behind-the-scenes featurettes, and more. Force Trainer: Wield a lightsaber and hone your skills by playing with the Force Trainer, an interactive activity where users can duel a training remote, as seen in Star Wars: A New Hope. 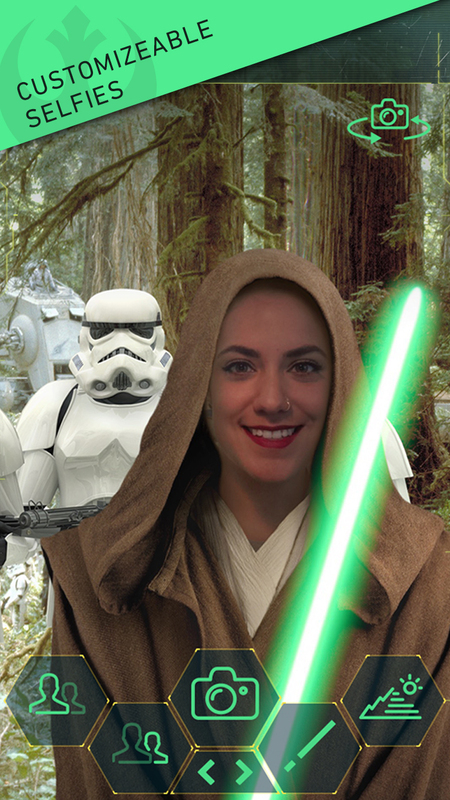 Star Wars “Selfie”: Take and share a Star Wars “selfie” in various iconic costumes and settings, including Jedi, Princess Leia, Han Solo’s carbon-freeze, and more. GIFs: Share animated GIFs with friends and family of memorable scenes and characters from the Star Wars movies and TV shows, including Star Wars: The Force Awakens and Star Wars Rebels. Soundboard: Play classic sound clips and sound effects from your favorite Star Wars characters, creatures, weapons, vehicles, and scenes. Star Wars History: Discover behind-the-scenes fun facts with This Day In Star Wars History. Weather: Get Star Wars-themed weather and five-day forecasts, featuring original art and parallax effects of in-universe planets and locales. join the growing Star Wars fan community by choosing an avatar, creating a handle, and building a connected profile. The app will continue to evolve along with the franchise, and users can look forward to regular updates and new features. 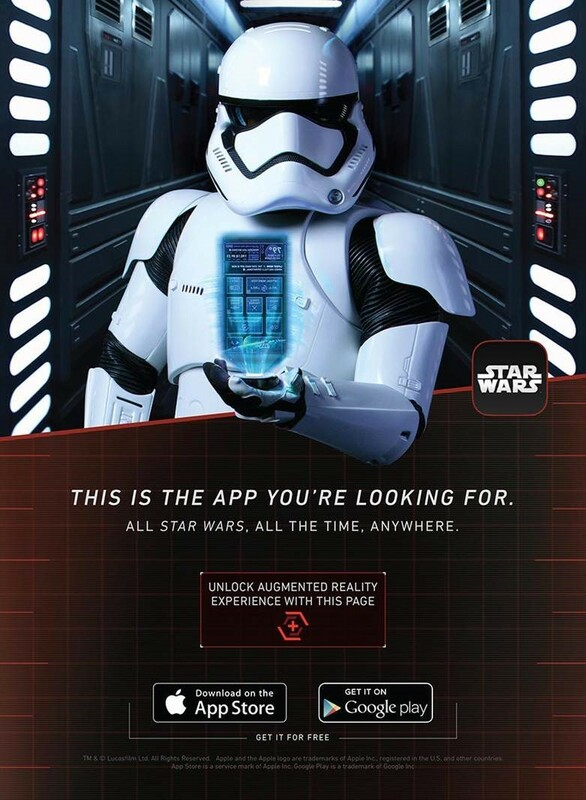 The app also helps fans discover the latest Star Wars digital apps, products and experiences. Download Star Wars for FREE from theApple App Store or Google Play.